Although long-time Windows users and developers, we wanted to try Linux on a thumb drive. We could have installed Linux to a disk partition and dual-booted, but we often change computers, and liked the idea of bringing our Linux with us– much harder to do with Windows due to licensing issues! We tried various “Live Linux” distributions designed to boot from a thumb drive with data persistence, but they have a big drawback: Updating to the next major version is not possible. With significant Ubuntu releases appearing every six months or so, we really wanted update capability. 1) Create a bootable Ubuntu USB drive using the free UNetBootin Windows application on a spare thumb drive, not our final thumb drive. 2) Restart the computer, hit F2 to go into BIOS settings, and disable the hard drive. We don’t want to accidentally install a boot loader or anything on our hard drive that interfere with booting Windows later. 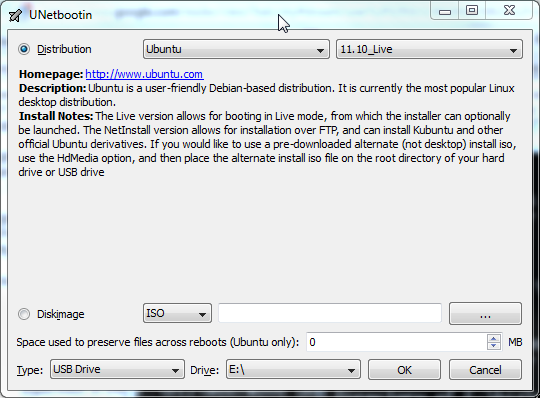 3) Boot Ubuntu from the temporary thumb drive. Insert the destination thumb drive and select “Install Ubuntu“, and follow any prompts. 4) If everything went right, we have created a bootable USB drive that runs Ubuntu and is capable of system updates. 5) Ubuntu booted fine, but did not hibernate successfully. Using Synaptic Package Manager, we installed the “hibernate” package, and all seems to work with no extra setup. 6) Of course one will want to install several Sagebrush Systems programs, so install Wine as described in our previous article. For the thumb drive, we wanted the smallest physical size possible, since the device would often be inserted into a netbook propped on a lap or carried in a backpack, so anything that stuck out far enough to snap off or fall out would be bad. If our computers could boot from an SD Card, then we would have used that instead of a USB drive, but SD Cards are not supported with any BIOS we tried. We settled on this low-profile microSDHC reader, with a 16GB Class 2 flash card, which was the fastest and largest memory we could afford at the time. 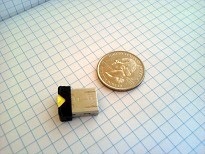 Class 2 means a sustained minimum write speed of 2 MB/s, which is somewhat slower than generic USB flash drives. In practice, the drive is fast enough for our purposes. In the table below we measure boot time to first web page access, which is a more useful metric than measuring to desktop displayed. In our experience a Windows 7 computer might not be ready to do useful work for many seconds after the desktop is displayed after cold boot, as start-up programs continue to load, virus scanners do mysterious tasks, and background services initialize. Additionally, the Windows 7 Wifi drivers on our machine seemed to take quite a long time to load, acquire an IP address, and load an initial complex web page. Test conditions: Computer is Asus Eee PC 1015PED netbook with N450 processor, running Firefox with one tab, re-loading the Sagebrush Systems homepage. Windows 7 was not optimized by removing unnecessary start-up programs and services, to illustrate a typical user case. Times given are an arithmetic mean of three measurements. Your mileage may vary. The plumbing is all connected and leak-free. Now let’s put coolant in the system and see if we get heat! Ordinarily we might use equal parts propylene glycol (not the more poisonous ethylene glycol) and water, about 4 gallons in all. However, we turned this system on in early autumn with no freezing nights possible, so we use tap water in the coolant loop. Once we gain confidence in the system we can refill with glycol/water mixture after a few days. First we connect a hose from a nearby faucet to the upper boiler drain valve, and another hose from the lower boiler drain valve to a drainage area out in the yard. We run the water for several minutes to flush out any flux and solder and other junk from the coolant loop. 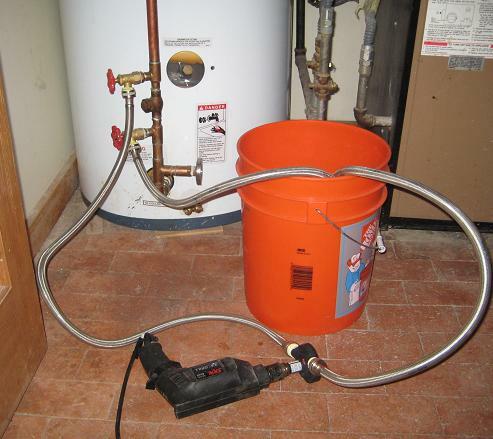 Following the directions in The article in Home Power magazine “DWHW Installation Basics Part 2” from June 2003 we run the pump with both valves open, and keep running until no air bubbles appear in the bucket. Then slowly close the lower valve and keep pumping until the pressure in the coolant loop reads about 20 PSI, then close the upper valve. We keep the bucket and hoses and pump together as a dedicated kit for possible future maintenance. With the pump running, take a trip to the roof to purge any air from the coin vent. Be careful: hot coolant might spray out and scald if you turn the vent valve too far too fast. With the pump running, we feel the pipes in the heat-exchange loop get warm, and then hot. I expected the storage tank to take several days to heat, but hot showers were available after only one-half day of system operation. Later we insulate the pipes exposed on the roof, secured with wire-ties. These pipes might get too hot for the insulation used to insulate regular home hot water plumbing; we used insulation rated for this temperature sold by our solar heating supply vendor. Go back onto the roof in a day or so and purge any air from the coin vent that might have collected. We would change the placement of the mounting board with pump and expansion tank to be more accessible for later repairs: lower and not as far in the corner. This is in an area where people pass by frequently and I thought the equipment would get in the way, but there was enough room. We would change the routing of the pipes going to and from the storage tank heat exchanger to first turn towards the wall and then make a right angle bend up to the mounting board. Once reaching the wall the pipes could be fastened with clamps for better support. We would attach components to the mounting board prior to attaching the board to the wall. We would follow more closely the example shown in “DWHW Installation Basics Part 2”, Home Power Magazine. Too many trips to the big-box home store for extra pipe fittings was caused by not carefully sketching in detail the plumbing for the entire coolant loop system, indicating every single fitting required– and then buying a few extra for last-minute changes. We added temperature gauges at both the inlet and outlet of the heat exchanger. In practice the difference in temperature is very small almost all the time. The heat exchanger relies on many trips around the coolant loop to get enough heat transfer to the storage tank. We learned this project is indeed possible for someone with a technical bent and little experience. If you have ever dabbled in car repair or significant home repair project then this is well within your grasp– at least if you have a flat roof. Our solar storage tank includes an auxiliary electric heater. If we had hooked up this electrical connection just after connecting the hot and cold water pipes, we would not need to be in a hurry to complete the coolant loop connections. Here is a graph from our gas bill in winter. See how much less gas we burn than last year? We are now paying much more for “access fee”, taxes, and fees than per/therm gas usage. If we could stop using natural gas for the stove and clothes dryer, we could unhook from the utility. We really like a gas range, but propane might do. We have ideas about the clothes dryer that might appear in a later post. After running for several months, we are encountering no problems. It just works! During winter months we do encounter winter storms with several consecutive days of no sun, and then the auxiliary electric heating element in the storage tank does turn on. During non-winter months we can turn off electricity to the tank altogether. Our March magnetic drive DC circulating pump might tend to be noisier than other type pumps, according to Home Power November 2007 article “Pick the Right Pump“. We live in a quiet neighborhood, and my office is located not far from the pump, and my personal preferences tolerate very little ambient noise. Our noise- meter measured 53dB at a distance of one meter during regular operation, not much louder than our refrigerator when the compressor is running. Somewhat more noticeable is the variation in pitch of the pump during semi-cloudy days, but nothing too objectionable. What will it take for solar hot water system panels and other system components to be sold in big-box home-improvement stores? 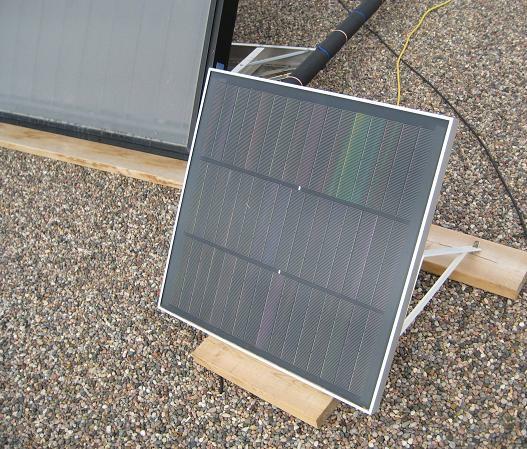 Should light-weight solar thermal panels be used, or heavier but very durable panels such as ours? 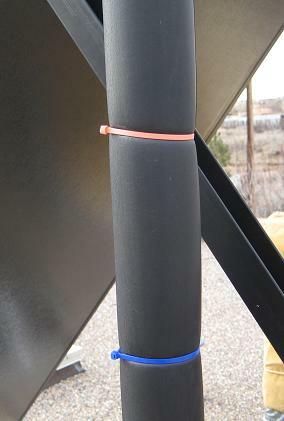 Should flexible copper tubing be used to ease the process of installation, or some sort of temperature-resistant plastic pipe? What diameter tubing still gives reasonable coolant flow and heat transfer? What components can sold in pre-assembled form for faster and easier installation? We welcome your thoughts. So need more “Sagebrush” blogs? The Sage Brush from Montana, a memoir of a youngster studying art with western muralist Bernard Preston Thomas. Sagebrush Spinoni, puppy pictures from a dog breeder. Sagebrush Bob, political diary on dKos.